Kostel Svateho Havla is located in Prague. Put Kostel Svateho Havla into our Prague day trip planning app and find out what's close by, where to stay, and where to head next. It is a church on the outskirts of Havel SCA market. Visit Havel SCA marketplace and have soared behind you can see. I went during the day, but was locked and could not be open to the public. Looks cute. Takes 10 minutes walking from the old town square. From looking at the carolinum, estates Theatre, came to this church. From the look I could not just closed the entrance and into Hubbell went to market. 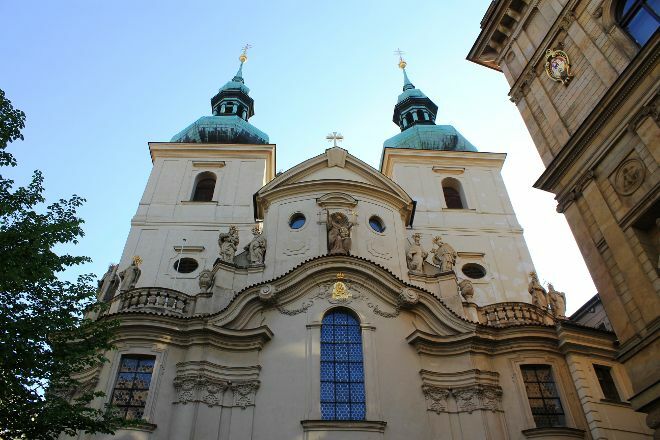 The parish church of St. Havel, founded by Wenceslao I in 1232, was one of the four main churches in Prague. In the mid-14th century, the Church was rebuilt in the Gothic style as a basilica with three naves, which is still evident despite the later Baroque modifications. Like most of the churches in Prague, this church was originally surrounded by a cemetery. At the beginning of the 17TH century it was donated to the Church of the Carmelites, who built a monastery, until in the 18th century became parish again. The Church of St. Havel was built in the first half of the 14th century. The remains of Romanesque masonry can be seen at present. In 1353 by Emperor Charles IV the Church were donated by the relics of St. Havel (skull), acquired in a Swiss monastery in St. Gallen. It was not the only offering to the temple by Charles IV, the Church had, in addition to a number of relics donated also the altars. Krásný barokní kostel v blízkosti Václavského náměstí. Oáza klidu v této rušné části města. The beautiful baroque church in adjacent to Wenceslas square. An oasis of calm in this busy part of the city. Chiesa di San Gallo situata nella Città Vecchia di Praga. Al suo interno vengono fatti anche dei concerti. Church of San Gallo located in Prague's old town. Inside it are made. Every day, we help thousands of travelers plan great vacations. Here are some tips on how to use your Listing Page to attract more travelers to your business - Kostel Svateho Havla. Promote your permanent link - https://www.inspirock.com/czech-republic/prague/kostel-svateho-havla-a1156996811 - on your website, your blog, and social media. When a traveler builds a plan from this page, the itinerary automatically includes Kostel Svateho Havla. This is a great way for travelers looking for a great vacation in your city or country to also experience Kostel Svateho Havla. Promoting your link also lets your audience know that you are featured on a rapidly growing travel site. In addition, the more this page is used, the more we will promote Kostel Svateho Havla to other Inspirock users. For best results, use the customized Trip Planning Widget for Kostel Svateho Havla on your website. It has all the advantages mentioned above, plus users to your site can conveniently access it directly on your site. Visitors to your site will appreciate you offering them help with planning their vacation. Setting this up takes just a few minutes - Click here for instructions.